U-M launches new initiative to address one of humanity's most critical and seemingly intractable problems: poverty. 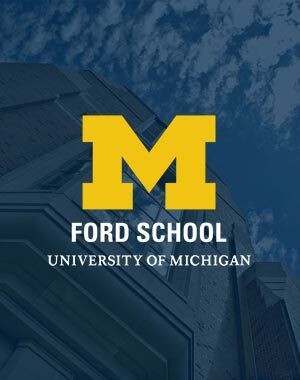 Established in 1914, the Ford School remains known for the strengths that have marked our reputation for decades: our distinguished faculty; our firm grounding in social science research and quantitative analysis; the vitality of our research centers; and our strong connections with scholars, programs, and opportunities from all parts of the world-class University of Michigan. These resources are a compilation for prospective students interested in learning about the Ford School's degree and certificate programs, tuition and fees, fellowships and grants, and application guidelines. This year's BA yearbook includes messages from many of the faculty members who have taught our undergraduate students, photos from commencement celebrations, and much more. The editorial board of the Michigan Journal of Public Affairs (MJPA) is pleased to announce the 2016 edition of the Ford School's student-run journal.